These curtains are wonderful -inexpensive,easy to clean(wash and dry) and to me say summer and relaxation. They are called narrow ruffle,perma-press in white and can be ordered at Country Curtains. 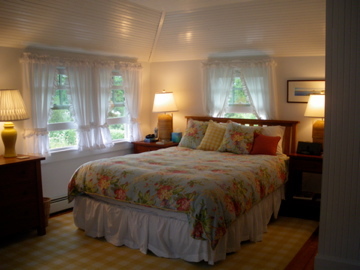 This entry was posted in summer/beach houses and tagged Beach house, Bedroom, Falmouth, Home Improvement, Interior Decor, Oak Bluffs Massachusetts, Summer house. Bookmark the permalink.